Having doors in our home is a natural way to maintain our privacy security but this doesn’t mean that we can’t think out of the box and use something else. Sometimes, in small spaces especially, doors can be quite a nuisance but don’t worry because here are some great alternatives you can use instead! Go for something soft and flowy like these cool beaded strings that won’t take up much space. This was a popular idea back in the ’70s but we find it really stylish and gives you that much needed privacy. 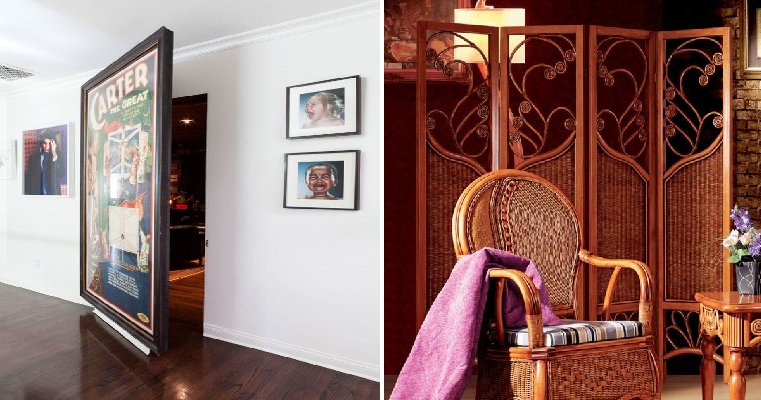 If you want to inject a playful vibe into your home then you should incorporate a hidden door. You can use anything from mirrors, large pieces of art or even camouflaged the door right into your wall. It will look totally cool! An accordion panel is a great way to get some privacy in a certain space of your home as it can be easily folded and kept when not in use. You can also choose an accordion panel that comes in different design to complement the rest of your home’s decor. Curtains are a popular choice as an alternative to doors because of its soft, flowy shape that doesn’t take up much space. It is relatively inexpensive and comes in so many styles and patterns that you are bound to find one that suits your fancy. Screens are a very convenient and easy method to add a little privacy into any corner of your home that you need. Since it is usually portable, it can even be used to divide up space especially if you have an open pan apartment. The traditional door swings open or shut and takes up more space but barn doors are space saving as it simply slides open. It is an awesome rustic decor that is very versatile and can fit any decor. The Japanese love nature and privacy so these wonderful sliding doors let you have privacy and let in light at the same time. They are covered in rice paper and slide in and out easily for a stylishly discreet door. Another space saving and stylish alternative to doors is by using glittery tassels that will instantly glam up any area of your home. It is a really pretty way to maintain your privacy and make your home look elegant.